The ancient concept of sect, which is the distinction between day and night charts, can be used to help explain why different people experience their Saturn returns in remarkably different ways. 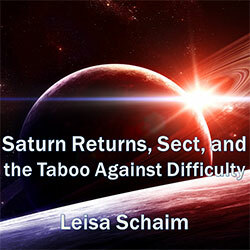 This lecture focuses on how the subjective experience of the Saturn return as either more challenging or more constructive can be altered depending on the sect of a chart, and what implications that has for how life’s difficulties are regarded in contemporary astrology. Included are a number of example charts so you can get a sense of how this distinction works out in real people’s Saturn return experiences. The lecture was recorded on September 27, 2014 in Phoenix, Arizona at a conference organized by the International Society for Astrological Research. A 70-minute audio lecture in MP3 format (48 MB digital download). A detailed 32 page PDF file containing all of the PowerPoint slides from the lecture.